Whiteley Royd Farm, situated in an area of outstanding natural beauty, provides 5-star luxury holiday accommodation On The Tops, above the bustling town of Hebden Bridge, which was voted the 4th funkiest town in the world and is packed with great little restaurants, cafes and shops. It sleeps between 2 and 6 (7), with 3 luxury bedrooms, 2 state-of-the-art bathrooms, one with sauna, a bespoke, contempory kitchen, comfortable lounge and dining area with open fire and TV-games console room that can double as an optional bedroom. There is also a separate outdoor games room with table tennis and table football. Whiteley Royd Farm is a great location for outdoor enthusiasts or for those who simply want to chill out and enjoy the views. The Pennine Way and Calderday Way are on the doorstep, together with The Pennine Bridleway and The Mary Towneley Loop. The Bronte village of Haworth and the National Trust Hardcastle Crags are nearby too. The accommodation, whilst retaining many original features, is fully double glazed and has underfloor heating throughout. Having bedrooms and a bathroom on the ground floor we can welcome visitors with mobility problems. Couples wanting a romantic get away may book the main wing. Pets are also welcome. Gravelled parking area. Entrance hallway with shelving storage cupboards and cloaks cupboard. Sitting room-dining room: The large sitting room incorporates the dining area. Stairs lead from the sitting room to the first floor landing. Three natural finish wooden pillars remain from the orginal barn structure. 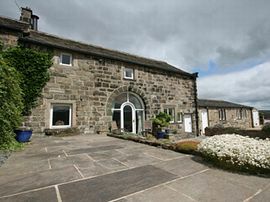 A barn window with arched patio door leads onto the patio with magnificent views towards Stoodley Pike. 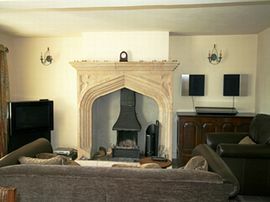 Ceramic tiled floor and carved stone fireplace housing an open fronted wood or coal burning stove. Bang and Olufsen HD flat-screen TV with FreeSat-HD, DVD, radio-CD, wireless broadband internet access. An attractive stone wall separates the dining area from the kitchen. Bespoke Kitchen: The kitchen has a ceramic stone floor matching the sitting room and a range of high quality units with granite worktops. There is also a curved granite breakfast bar. There is a Smeg six burner gas hob with electric oven, grill and extractor fan. 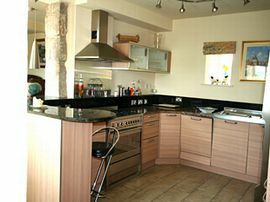 There is a dishwasher and large Whirlpool fridge-freezer with chilled water and ice dispenser. Bedroom 2: Ideal for disabled visitors. With zip n link beds (can be twin or super-king, please advise layout when booking). Windows to the front with magnificent views windows to rear. Bedroom 3: Ideal for disabled visitors. With zip n link beds (can be twin or super-king, please advise layout when booking). Ceramic tiles floor. Windows to the front with magnificent views and windows to side. Downstairs Bathroom: Shower room with corner shower, WC, wash hand basin, heated towel rail and shaver point. Utility Room: Washing machine, tumble dryer and storage space for walking gear. Landing: Beamed landing with original roof truss. Access to bedroom 1, TV/games console room and bathroom. Bedroom 1: Master bedroom with double bed. The bedroom has original featurews including original roof truss carefully restored to support the high pitched ceiling. Views along the valley towards Hebden Bridge from the traditional Venetian window with padded window seat. TV/Games Console Room: Beamed room with TV, Freesat, Computer and Games Console. Can be made into optional single bedroom. Front window overlooking the patio. Sauna Room The pine sauna has a ceramic tiled floor, fitted benching and seating. Electrically heated coal unit. Gravelled parking area which can accommodate many cars. The large cobbled and paved patio areas adjoin the sitting room. Raised flower beds border the patio, together with a stone wall surrounding an ornamental pond with coi carp. Comfortable garden furniture, with gas heater and BBQ overlooking the awe inspiring views across the valley. Free range duck and hen eggs may be collected and organic seasonal veg may be available. There are extensive fields available to use, one with trampoline. Games Room: The detached garage has been converted into a games room with table tennis table, table football and dart board. There is also space to store bikes. Bed linen and towels are included. Welcome pack provided. A travel cot and high chair are available upon request. The view from Whiteley Royd Farm plus duckling! Two downstair bedrooms and bathroom. Luxury Egyptian cotton bedding and Egyptian cotton towels. Welcome pack provided. Garden, large flagged patio, bbq, gas patio heater, games room with table tennis, table football. Fields. Plenty of parking space. Local Services: Two local pubs 1-2 miles away. Local farm produce available at top of lane. Nearest shop 2.5 miles. Hebden Bridge 3.5 miles. Weekly rates £510.00 to £920.00 depending on the season. 3 and 4 night options also available. See the Whiteley Royd Farm website (link above). For a romantic get away, if there is availability within 4 weeks of you booking, the main wing, suitable for couples, may be booked at 80% of the full rate.